A British company has unveiled a new robotic surgery system, which is expected to operate on patients for the first time next year. The Versius robot, designed and built in Cambridge, is a rival to the American da Vinci system, which is used in more than 70 hospitals in the UK. Versius is smaller, and the company behind it, CMR Surgical, believes it will be more flexible and versatile than existing robots, allowing it to perform a wider range of operations. Versius has independent modular arms which are "quick and easy to set up", said Luke Hares, co-founder of CMR Surgical. "This means hospitals will be able to keep it busy, making it economical to run." Each of the robot arms has flexible joints like a human arm, which are controlled by a surgeon sitting at a console using two joysticks and a 3D screen. Robot systems use laparoscopic, also known as keyhole, surgery, which is carried out with special instruments via small incisions. This leads to reduced pain and faster recovery for patients, compared with conventional surgery. Robotic surgery also gives surgeons a better magnified view and increased dexterity. "It takes around 80 hours to teach suturing with manual laparoscopic tools and some surgeons find it impossible to master," said Addenbrooke's Hospital surgeon Mark Slack, a co-founder of CMR Surgical. "By contrast, it takes half an hour to teach using Versius - this will enable many more surgeons to deliver the benefits of keyhole surgery." 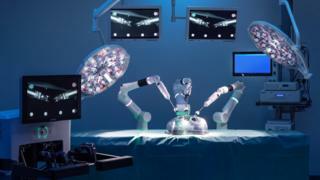 The robotic surgery field is dominated by da Vinci, made by Californian company Intuitive Surgical. Da Vinci robots have been operating in the UK since 2001 and there are now more than 4,500 worldwide. They are used mostly for prostate, bladder and gynaecological surgery, although their range of operations is expanding. Key patents for the da Vinci system recently expired, which has encouraged other companies to enter the field of surgical robotics. Google has partnered with Johnson & Johnson on medical equipment manufacturer Verb Surgical. The company aims to have its robots connected to the internet so they can learn from each other. It is aiming to launch in 2020. Medtronic, the world's largest medical device company, also has a surgical robot, due for release next year. Nadine Hachach-Haram, a plastic and reconstructive surgeon at St Thomas' Hospital, London, said robotics will play an increasingly important role in the operating theatre. "The newer generation robots are more versatile, compact and cost-effective, which means we can deliver robotic surgery locally and not in large hospitals with dedicated robotic suites," she said. Dr Hachach-Haram, a member of the Royal College of Surgeons' Commission on the Future of Surgery, said, in the future, robots may do some elements of surgery independently. "Surgeons will remain in control but as we develop the human-robot interface there may be simple parts of an operation, such as suturing or closing a wound that may be automated." The Versius robot is expected to receive a European health and safety approval mark within the next few months. The price of the robot system has not been revealed, but CMR Surgical says it aims to make it more cost-effective for NHS hospitals than its American rival.